All right. So my random experiment of setting a book available to order and seeing if the info page would be enough to sell it didn’t pull through. It was a long-shot, anyways. You’ll hear from me about this next year. THERE’S A BOOK TRAILER FOR THE TEST!!! You can watch it from the link below OR view it on the book page. I was also interviewed by my blogger friend Jasmine, which you can read HERE. That’s all for now until we reach 50 orders, where the T-shirt and poster raffles will begin with a winner picked every 50 orders. Until then, the first 50 orders will receive a T-shirt & poster for being awesome early-bird supporters! This is what I’m calling my "crowdfunding experiment" in that I’m not going to really promote it very much. My goal is for it to promote itself in that the writing and page will garner enough interest for those who stumble across it to immediately turn around and tell people about it. So if you want this book to succeed, the power is in your hands. 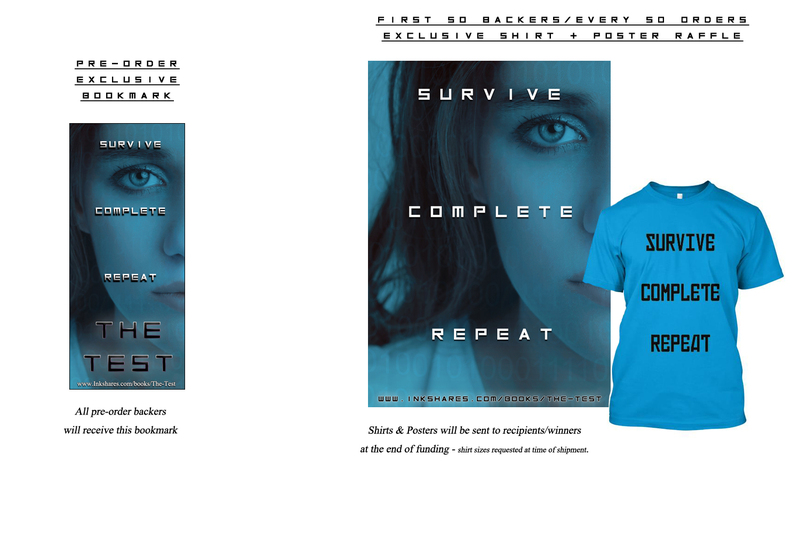 THE FIRST 50 BACKERS WILL GET A T-SHIRT & POSTER! So hurry up because there’s only 44 spots left. After that there will be a raffle every 50 orders (the first 50 people are exempt from these for obvious reasons . . .) BUT everyone who pre-orders The Test will get an exclusive bookmark! While I’m really excited about this, again, I will not be promoting this much as I have the end of the year set aside for edits on my funded project, Scribbles. But since I set a little over a year’s time for this to reach full funding (going for the gold with this one!) I’m very confident it can reach funding within that time . . . and, hey, if sooner then that’s awesome, too! Book trailer coming end of the week!!! REVIEWS & RECOMMENDATIONS HIGHLY ENCOURAGED! SPECIAL NEWS COMING (Read: prizes) FOR THOSE WHO DRIVE THE MOST RECOMMENDATIONS & REVIEW/SHARE CHAPTERS. Stay tuned. Special thanks to Peter Ryan for being backer #1, and to James Rasile, Andrew Wood, and Jasmine Carlisle for being the first to recommend!